This entry was posted on February 10, 2010, 12:16 am and is filed under Thoughts & Vents. You can follow any responses to this entry through RSS 2.0. You can leave a response, or trackback from your own site. Great News, yesterday I watched a movie about the dark ages being the gold ages for the world because of the Muslims inventions.. And now this.. There is a change going on.. There is a movement toward opening subjects that were not allowed before.. Absolutely, Reem. This film is very open and bare! And I love what it has to say! Hmmm… that does sound interesting. The Palestinian hattah is either an unconscious prop (which doesn’t seem likely) or a real “symbol”. Here in the Arab world it symbolizes Palestine and the Palestinian struggle for freedom, and generally the struggle against oppression (note the way it is actually “banned” in some places, and anyone wearing it is singled out by police). I wonder if it has the same meaning in the West. 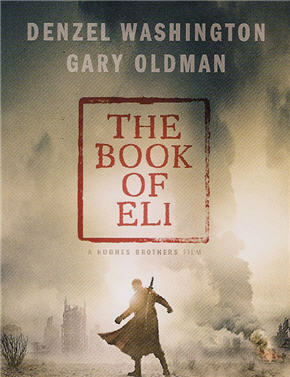 And the naming “the Book of Eli” is also intriguing. It is obviously echoing titles of books within the Bible, but is it really referring to the Bible Eli is carrying around? Or is it more of a reference to Eli’s own quest? Does that (the fact that a man is prepared to undertake a quest to spread peace and save “religion”) become the “book” that will bring peace? This movie does seem like one that should be watched. P.S. Just one question: why did the cat have to die? was that really necessary for the plot? Thanks Marwa for further pointing out why the Palestinian Hattah is so important for us in the Arab world. The questions you pose about the film are right into the very plot. I think it’s somewhere in the middle, but if I give a detailed answer I would definitely ruin it. Since you came to this point, I think you should definitely go and see it. You will enjoy what this film has to say. The killing of the cat was in fact a rather unfortunate beginning, the interesting message behind that, however, was in what was done with the cat’s meat. I would say it was an attempt to set the scene for a desperate and very much upside down world. Thanks for your comment! Why don’t you share with us what you think? The King James Bible that is represented in the movie is the Christian Bible not Muslim. Jesus Christ is the WAY, the TRUTH and the LIFE. No man comes to the FATHER except by and through the Lord Jesus Christ! Please consider this in light of the movie you are commenting on and what it represents.